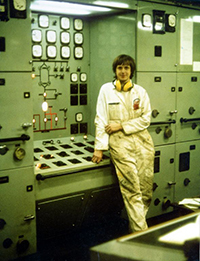 I joined Esso Petroleum Ltd. in 1977 as an Electrical Officer. 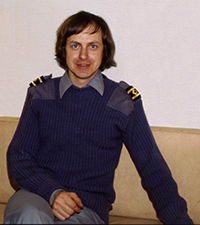 I joined my first ship on 21 May 1977. This was the Esso Cardiff and I spent my first 5 weeks at sea under the supervision of Eddie Ralph. 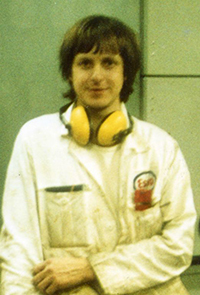 I then got sent to the Esso Warwickshire where I joined another 'first-trip' Electrical Officer. Together we got through our first trip until it was time to go on leave. I sailed on the Esso Cardiff many times over the years and she was very much my favourite ship. I was with her on her final passage from Rotterdam to Ulsan (South Korea) where I bade her a final, and very sad, 'goodbye' on 13 October 1983. I stayed with Esso until 23 August 1984 where I left the Esso Humber in Las Palmas in the Canary Islands. I have to say that Esso were a good company to work for and I was sad to leave in many ways. My first trip with Townsend Thoresen was on 25 May 1984 on board the Pride of Free Enterprise. This was whilst I was on leave from Esso as we had to give three months notice of termination of contract. I worked for TT until just before joining the Esso Humber on 28 June 1984. After this trip I joined TT full-time and sailed on a number of their vessels between Dover and Calais and also Dover and Zeebrugge. TT were a really good company to work for so it was a big deal when P&O European Ferries took over the company as things went from really good to really awful in a very short time. P&O European Ferries was gradually merging with, and taking over, Townsend Thoresen around the time of the tragedy of the Herald of Free Enterprise that occurred on 6 March 1987. I was on a board the European Trader which entered Zeebrugge just as the Herald of Free Enterprise was departing. We got called to standby the stricken ship and sent one of our lifeboats with some of our personnel with medical and rescue equipment to help in the rescue operation. After this disaster, I was asked to work on board the Vortigern a train carrier that P&O had chartered in order to maintain the service that the Herald had been doing. This meant that I was working with the survivors and off-duty crews from the Herald which was quite traumatic at times (the electrical officer of the Herald having been killed in the disaster). I left P&O on 31 January 1989, solely because of the way personnel were being treated - and there was always the potential for another accident when people are too tired to do their job properly.